The fact that there exist in the space around the Earth (the space up to the geostationary orbit altitude, known as Geospace) natural trapped charged particles, Van Allen belts, that might influence commercial satellite services (GPS, communication, meteorology, and others) is well known. There is a concern that astronauts would be exposed to these charged particles, for instance, during a manned mission to the moon. It is well-known that the high-energy electrons in the Van Allen belts of Earth are produced by resonant interactions of electromagnetic chorus waves that evolve in the magnetosphere with energetic electrons; this phenomenon is known as a chorus wave-particle interaction. The chorus wave-particle interactions are known to speed up electrons to relativistic energies as well as precipitate energetic electrons from the magnetosphere along geomagnetic field lines and into the Earth’s atmosphere to generate unique types of auroras. Moreover, it has been proposed that energetic electrons that precipitate along geomagnetic field lines and into the Earth’s atmosphere not just create auroras but also alter the atmospheric composition. Therefore, exploration of the magnetosphere, in which the chorus wave-particle interactions are produced, should offer hints at the magnetosphere’s electromagnetic environment and of its impacts on the Earth’s atmosphere. This field has gained international attention for over five decades. Yet, due to the fact that a single chorus wave packet lasts only for less than a second, and as it is nearly impossible to explore the vast magnetosphere with a limited number of scientific satellites, the spatial development, specifically, of the magnetosphere has been poorly perceived. The current team of international researchers includes researchers from Kanazawa University, Nagoya University, The University of Electro-Communications, National Institute of Polar Research, Kyoto University, Tohoku University, Institute of Space and Astronautical Science of JAXA, University of Florida (USA), National Institute of Information and Communications Technology, Athabasca University (Canada), and three other institutions. The team used Arase, a scientific satellite launched in 2016(with the ability to investigate the dynamics of Van Allen belts and also geospace storms), and successfully captured simultaneously for the first time not just the magnetosphere’s chorus wave packets but also transient auroral flashes (several hundred milliseconds) located about 30,000 km from Arase, and produced by chorus wave-particle interactions. Simultaneous capturing of the aurorae and the chorus wave-particle interactions, which are related to each other, requires a scientific satellite to be in a suitable orbit as well as an observation network on the ground that achieves conjugate observations with the satellite. 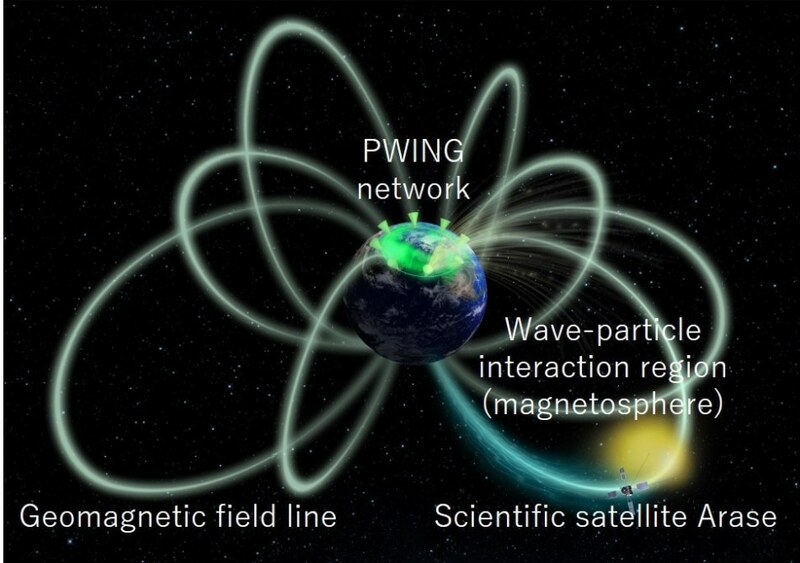 The researchers created a world-renowned electromagnetic wave measurement system, which was used in the Arase satellite, and determined PWING (study of dynamical variation of Particles and Waves in the INner magnetosphere using Ground-based network observations) covering the entire Earth (but principally in the northern hemisphere) longitudinally along nearly the same geomagnetic latitude. The members of the research team actively traveled to install new high-sensitivity cameras and other instruments in each PWING international ground base. Thus, the Arase satellite was able to obtain details of the chorus waves as well as capture related aurorae from any longitude and at any time. This allowed simultaneous observations with a high time resolution of 10 ms.
A flash aurora captured at Gakona, Alaska, USA, one among the many PWING international bases, connected with the Arase satellite along the geomagnetic field line, exhibited spatial and intensity variations of the order of hundreds of milliseconds, with respect to those of chorus waves in the magnetosphere. This observation showed that a flash aurora could turn out to be a display of spatial developments of regions of wave-particle interaction that accompany chorus waves. The spatial and intensity changes of aurorae observed on the ground include visualized details about regions of wave-particle interaction that cannot be captured by point observations with a scientific satellite. For the first time, the geomagnetic north-south asymmetry has been confirmed by the observation. The noted changes suggest not just spatial evolutions along geomagnetic field lines through effective resonance of electromagnetic waves and electrons (that can be observed as time-dependent variations of auroral intensity) but also evolutions across the geomagnetic field lines (that can be observed as spatial variations of auroral morphology). The observation also indicates very fast precipitation of energetic electrons into the atmosphere within a matter of hundreds of milliseconds, which could lead to changes in the atmospheric composition. This study has disclosed spatial developments of regions of wave-particle interaction across geomagnetic field lines that were earlier obscure. It offers analyses with the help of a scientific satellite in combination with a ground observation network. In the times to come, it is necessary for more features of a general nature to be disclosed by investigating a large number of flash auroras. Yet, there could be challenges in analyzing the huge data sets by traditional visual observation, as it has now been discovered that such unique aurorae revealing details of spatial developments of regions of wave-particle interaction have a duration of just a few hundreds of milliseconds. However, the current international research group was able to overcome this difficulty by employing artificial intelligence (AI). AI technology should make it feasible to create hazard maps of the magnetosphere’s electromagnetic environment, which should enable safe and secure space exploration. It is also obvious that chorus wave-particle interactions occur on other magnetized planets. Mio, a scientific mission launched in 2018 for analyzing the magnetic field of Mercury, is provided with a copy of the electromagnetic wave measurement system created by the current team and is anticipated to disclose their characteristics. Detailed observation performed by Arase, the scientific satellite, in the magnetosphere as well as the observation of aurorae along geomagnetic field lines from the ground will make it possible to explore and capture the spatial distribution of regions in which wave-particle interactions are generated.